Sometime between 6 - 6:30 p.m. Thursday, Second Avenue N.W. in Faribault, where it crosses the Cannon River, was closed. Two dams are located next to this stretch of now flooded roadway. We are swimming in water here and the rain continues to fall. Earlier this evening we toured the town—yes, we were gawkers—and found swollen rivers and closed roads. 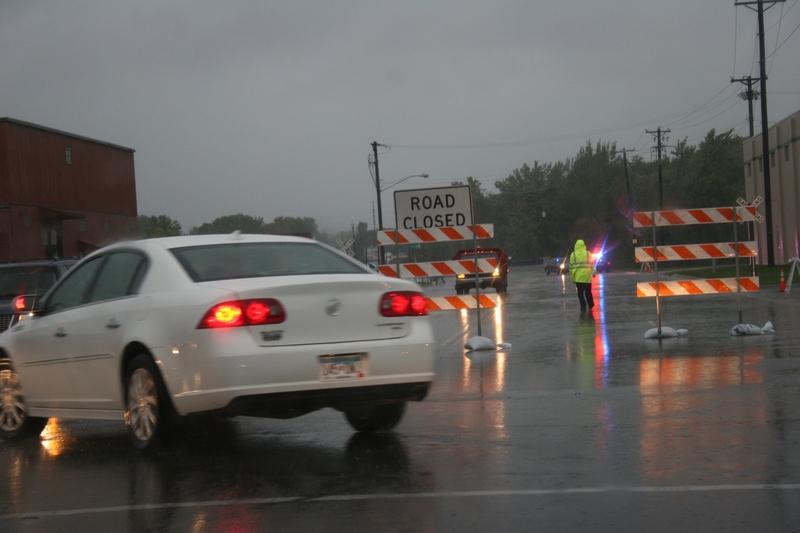 Four-lane Second Avenue N.W., as it crosses the Cannon River, was flooded with four inches of water and down to two lanes when Randy drove across the bridge around 6 p.m. A half hour later, officials had closed the street. Near the blocked road and behind the former Faribo Woolen Mill, we met a homeowner in hip waders waiting for the city to deliver sandbags to his riverside home. His property hadn’t flooded yet, but he was worried. He’s lived there since 1985 and never seen the river so high, he says. Nor have we. Randy has lived here for 32 years. I’ve been here for 28. 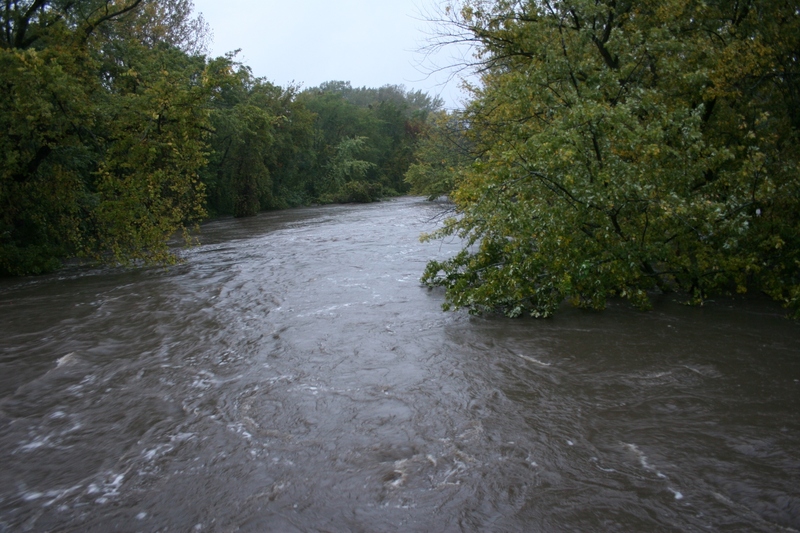 Standing atop a bridge on the north end of Faribault, I snapped images of the rushing Straight River. Even from the safety of the road, I felt unsettled, watching as the muddy waters churned and roiled and rushed away, edging away from the constraints of the rain-logged banks. The rain is expected to continue into Friday. 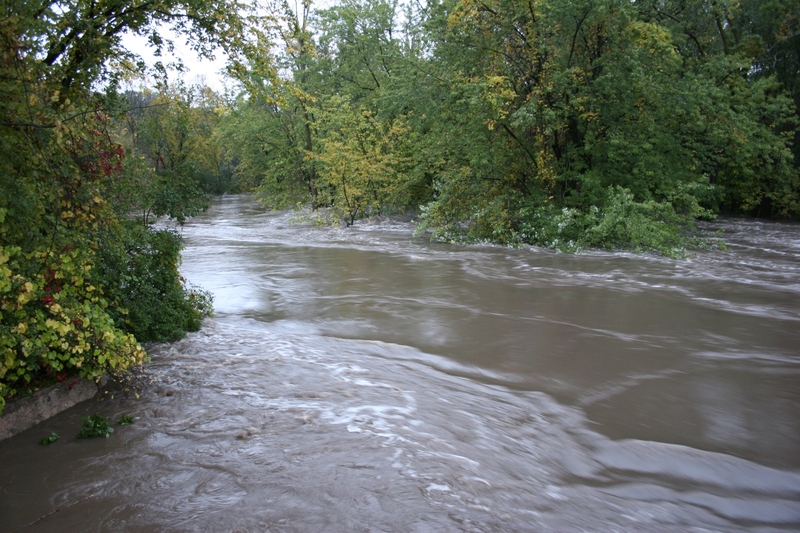 A view of the raging Straight River from a bridge on the north end of Faribault. 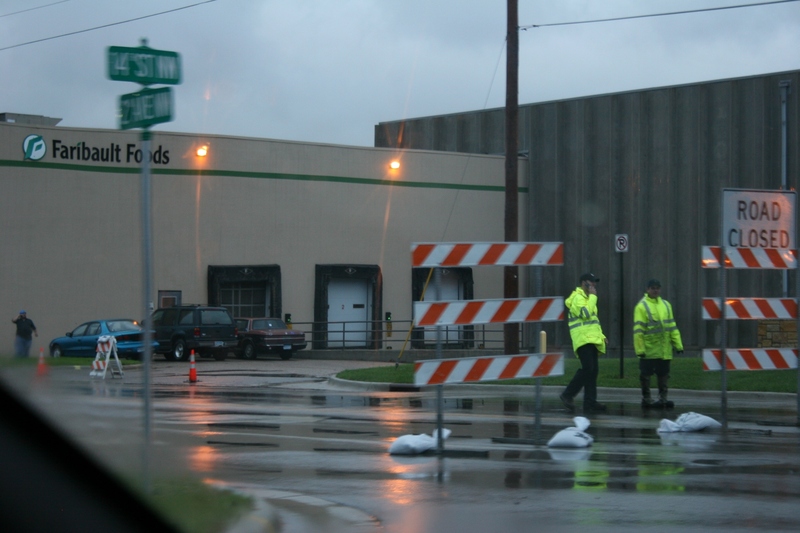 Second Avenue N.W., which crosses the Cannon River, was blocked at Faribault Foods. 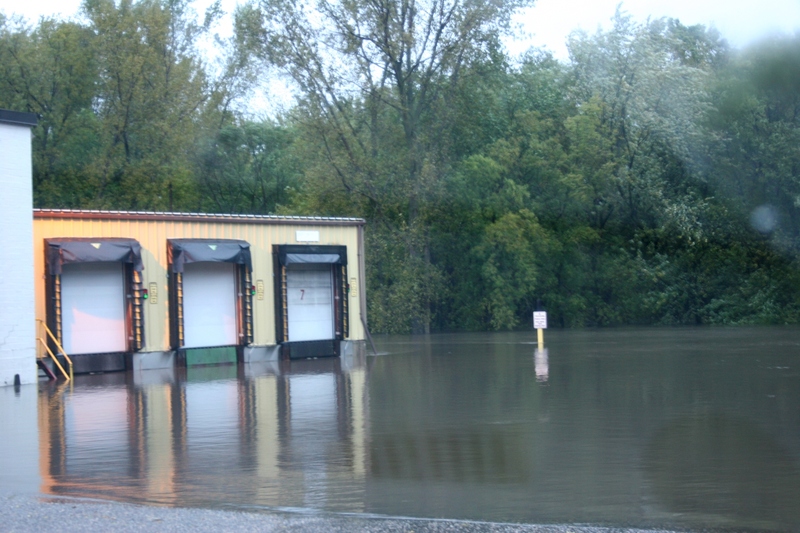 The Straight River spilled over its banks into a parking lot and loading dock area at Faribault Foods. 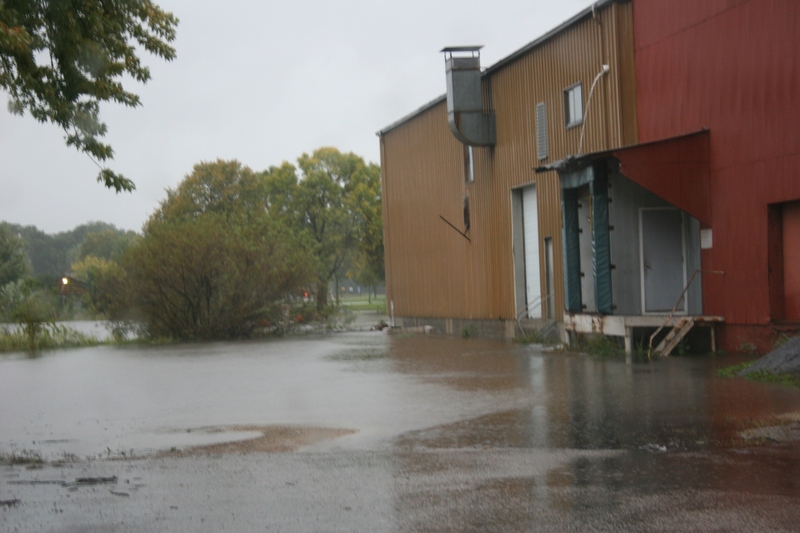 The Cannon River overflowed its banks behind the former Faribo Woolen Mill. Next door, to the left in this photo, a homeowner awaited sandbags to protect his home. In South Alexander Park, the Cannon River spilled onto park land. 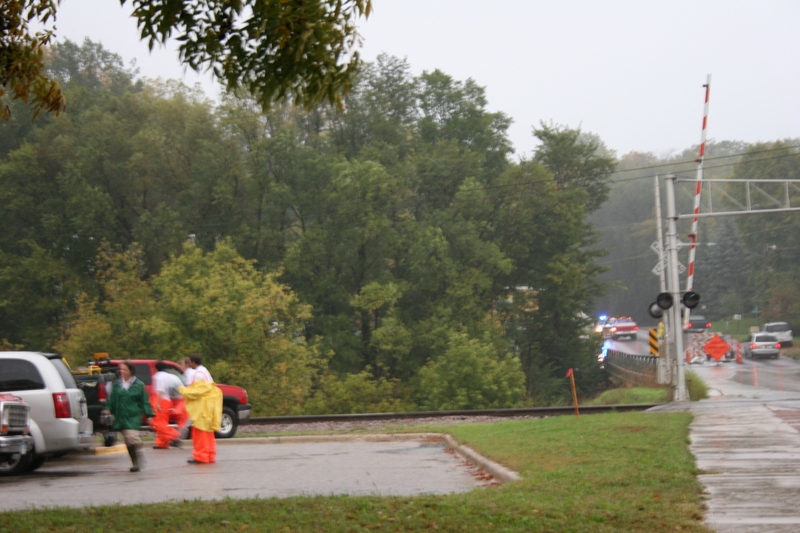 Along Ravine Street, crews kept a watchful eye on the Straight River. 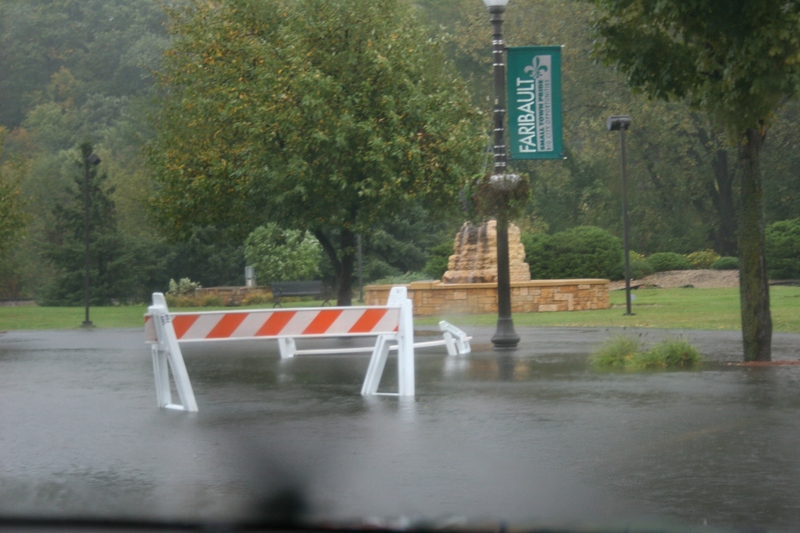 Flood waters caused the closing of a portion of Heritage Place at Heritage Park. 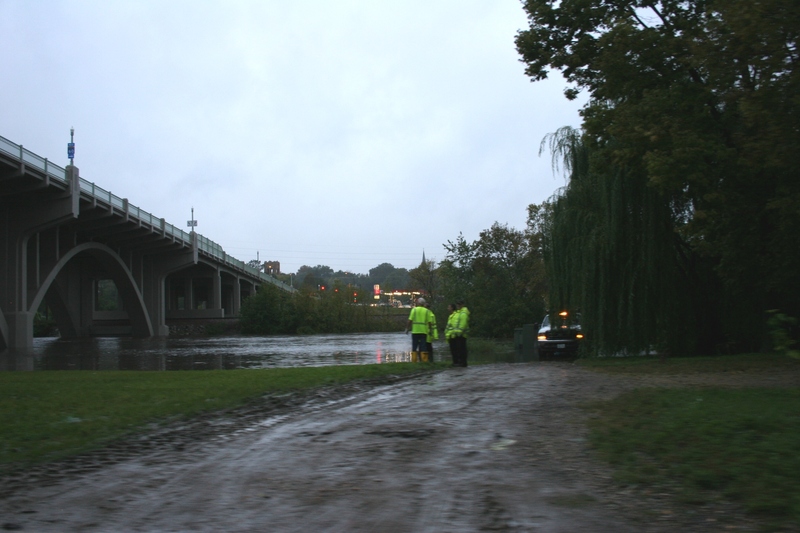 Officials closed flooded TeePee Tonka Park near the Straight River viaduct in the central part of Faribault. 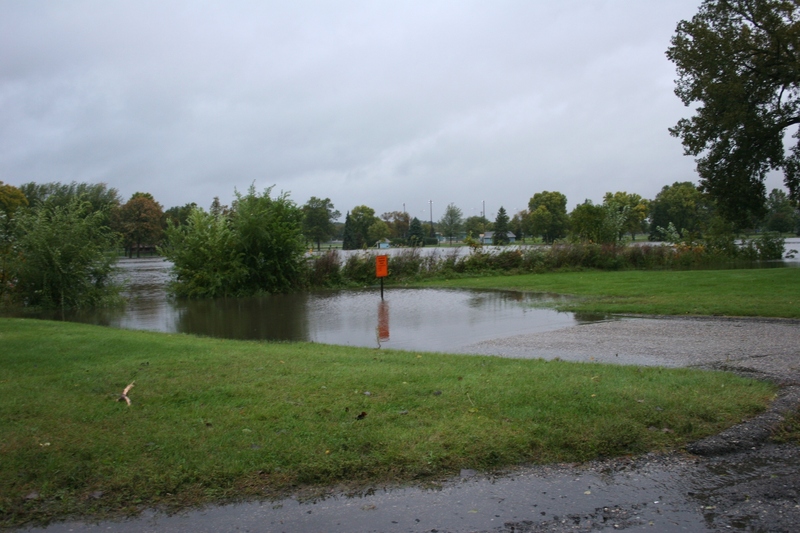 The Straight River on the north end of Faribault continues to rise. Most of these photos were taken through the windows of a car in fading daylight. IN BETWEEN ALL the rainstorms that have defined today and yesterday and so many days here in Minnesota this September, I offer a ray of sunshine. I am sitting here in my office typing this as the preschool neighbor boy I’ve never met, because our busy, busy street seems as wide as the mighty Mississippi, splashes in water puddled on dips in the uneven sidewalk. Until this moment in this rainiest of days, I have thought only of how very sick and tired I am of all the non-stop rain, the gloom, this weariness that has descended upon autumn. And then I see this boy, this happy, happy boy dressed in his sunny yellow t-shirt, khaki pants and flip flops splish-splashing through the water. Father and son have been outside for more than 15 minutes now. Together they’ve run through the puddles, stomped their feet, splashed and jumped. Run and leap. Turn around and race again through the pooled waters. I cannot stop watching them. On this day when I’ve heard of flooded roads and flooded basements, closed schools and rising rivers and more rain in the forecast, I am smiling. I am smiling at the young father, clad in a tank top and shorts and flip flops. He doesn’t care whether his boy gets his clothes dirty or his feet wet. With the wave of his arm, he encourages his son to forge through the water. For a moment I have forgotten about the gloom of the day. I see only sunshine. I’LL ADMIT TO MORE than a bit of skepticism about a children’s picture book titled Pickle Bumps for Baby Dill. “What kind of book is that?” I wondered before calling the author, Bob Fulton. Well, exactly as the title suggests, this is a story about Baby Dill, a pickle born without bumps. But that’s not all. You see, after speaking with Fulton and upon reading his book, I learned the real purpose. And it’s much more than a story about cute, talking pickles. That’s a message especially fitting for this time of year, the beginning of school. I would speculate that many students have, in recent weeks, felt like they don’t quite fit in with their classmates. Maybe they aren’t wearing the latest fashions. Maybe they’re in a new school, struggling to make friends. Maybe they’re shy, quiet. Maybe their hair or their skin is the “wrong” color. Maybe they’re struggling with learning. Maybe, like Baby Dill, they wonder why they are different from everyone else. Fulton addresses that concern, which leads the Dill family on a shopping trip for pickle bumps. In the end, Baby Dill decides, with the support of his friends, that he would rather remain bump less. While Fulton’s story has a positive ending, I know that isn’t always reality. In real life, kids bully, tease, make fun of, pick on, humiliate—whatever words you want to choose—those who are different. For all too many kids, there are no understanding friends to stand by and support them. A book like Fulton’s offers encouragement. “We like you just the way you are,” Baby Dill’s friends tell him. That’s a message that needs to reverberate through-out our schools, our homes, our communities. 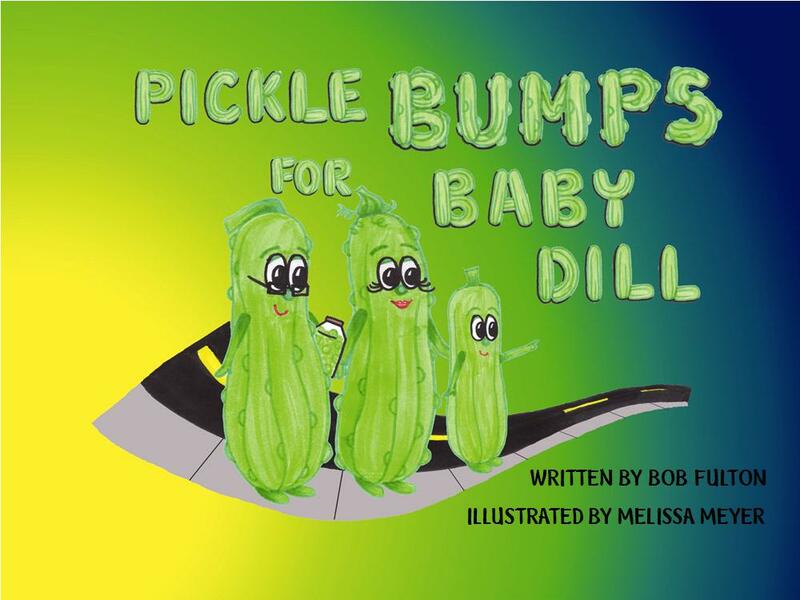 Pickle Bumps for Baby Dill would be a good addition to any elementary school classroom or library. While aimed at preschoolers and lower elementary students, the story also appeals to 10 – 12-year-olds, Fulton says. Having experienced bullying myself while in junior high school, I applaud any efforts to help students, parents and teachers address the issue. The college educator—he taught chemistry for 39 years at St. John’s University and The College of Saint Benedict—has even added a list of 12 questions at the end of his book to prompt discussion. Fulton did and then put his tale into writing in Pickle Bumps for Baby Dill, published by Pickle Bump Press. Melissa Meyer, originally from Saint Joseph, Minn., illustrated the book. AS A SIDE NOTE, please be aware that October is National Bullying Prevention Month. Check out the PACER Center Web site for information that can help you address bullying. Perhaps by working together, through understanding and listening and empathy, we can help reduce the bullying that is all too prevalent in our society, especially in our schools.